Citation Information: J Clin Invest. 2017;127(5):1813-1825. https://doi.org/10.1172/JCI91816. ILC2s are sensitive to radiation and chemotherapy conditioning. 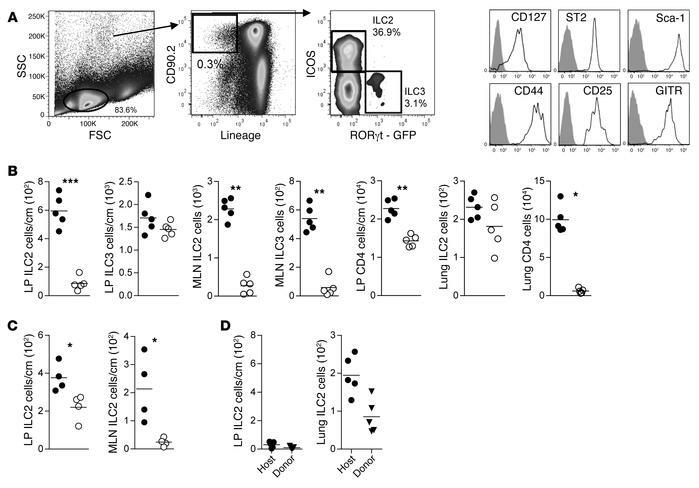 (A) Flow cytometry gating scheme used to define ILC2 and ILC3 subsets in MLN. (B) Quantitation by flow cytometry of innate lymphoid and CD4+ T cells in the LP, MLN, or lung in mice without irradiation (filled circles) or 24 hours after receiving radiation (950 cGy) (open circles). Results represent 3 independent experiments; n = 5 for each group. (C) Quantitation of ILC2s in the LP and MLN in mice receiving no therapy (filled circles) or 24 hours after receiving 200 mg/kg of cyclophosphamide (open circles). Results represent 2 independent experiments; n = 4 for each. (D) Quantitation of host and donor-derived ILC2s in the LP and lung 28 days after BMT; mean ± SEM. Results represent 2 independent experiments; n = 5. Statistical analysis by Student’s t test with Welch’s correction, ***P < 0.001, **P < 0.01, *P < 0.05.